XP Power has launched a new range of 20 Watt DC-DC power modules with international agency approvals for medical/healthcare applications. The series is suitable for all medical applications and particularly intended for use where the DC-DC converter provides a reinforced (2 × MOPP) safety isolation barrier, including patient contact and patient vicinity applications. The JHM20 series comprises a total of 18 modules, offering 20 Watts of power in a compact 50.8mm × 25.4mm PCB-mount footprint. 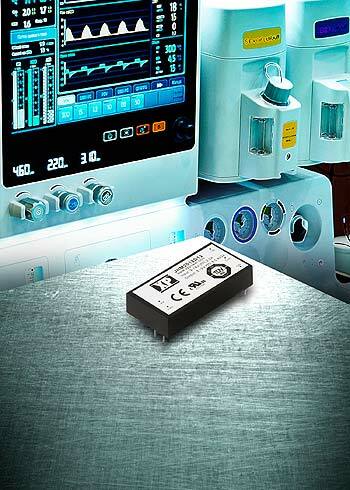 The 2:1 input range offers flexibility with nominal input voltages of 12, 24 and 48VDC. Isolated, fully-floating, single and dual output versions are available at 5, 12 and 15VDC, allowing the provision of single rails of 24 and 30VDC. All single outputs are simple to trim by 10% via a single external resistor. The modules offer excellent levels of efficiency and operate from -40C to +80C, delivering full power at temperatures up to +60C allowing use in challenging applications. A wide range of protection mechanisms such as short circuit and overload are included to protect both the power module and the system load. The case is made from a self-extinguishing UL94V-0 material. The JHM20 series is available from Digi-Key, element14, Farnell, RS Components, approved regional distributors, or direct from XP Power and comes with a 3-year warranty.